The beautiful and tranquil setting, in a valley along the northern rim of the oft-overlooked island of Molokai, belies a fascinating history. Established in the 1860s, Kalaupapa is the site of what was effectively an island prison: lepers were banished here in accordance with mandatory isolation by Hawaiian King Kamehameha V, and the facility housed as many as 1,200. This held for a century: until 1969, ten years after Hawai'i's becoming a U.S. state, the policy of isolation was still in effect. The site has since become a National Historical Park operated by the National Park Service. 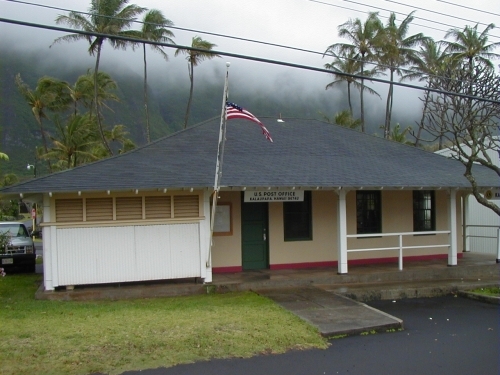 Last summer, USPS announced the study for closure of the Kalaupapa post office. By December it was determined that the office couldn't be closed, despite the small population served. Even former sufferers of leprosy have the right to universal postal service, too! My friend, a fellow member of the PMCC, took a tour to the site last January, and notes that while it's possible to photograph the office, access to get a postmark in person is frequently denied so as to prevent interactions of tourists with the town's residents, who have been scarred by leprosy in the past. In this instance tour operators will take philatelic materials to be hand-cancelled at a later date. It's not every post office that gets its own review page on TripAdvisor. Clearly, this place is cool. The island of Molokai also houses the small town of Hoolehua, the story of which I first read in my Let's Go: Hawaii travel book. The premise is that you can actually mail a coconut, free of packaging, so long as you have a postage/address label affixed to one side. First, let me validate that yes, you need no packaging (so long as the coconut is not being shipped internationally). Heck, here's a company that lets you order them, slaps a shipping label on them, and puts them in the mail. Coconuts are considered so resilient, and otherwise tamper-proof, that USPS and the Postal Inspection Service will indeed allow a coconut to be mailed free of external packaging. The cost ranged from perhaps $8 to $12, depending on its size. Now that's cool in and of itself, but the Hoolehua Post Office takes it one step further: they provide the coconuts for shipping themselves. They even have permanent markers that you can write the recipient's address on. Definitely a must-visit. The guy's got lots of photos of the process on his Flickr page. 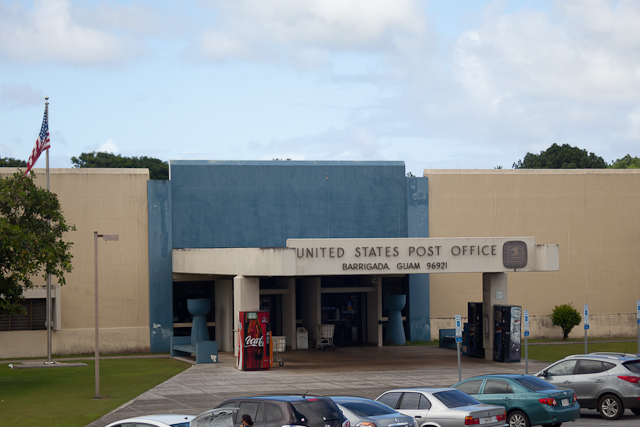 USPS not only administers the mail for Guam and American Samoa, but also for other 'commonwealths in political union with the United States' (the Northern Mariana Islands) and other countries closely associated with the U.S. (the Marshall Islands). They are U.S. Post Offices! Of course, you can read about all the post offices of Hawai'i and other Pacific Islands in the PMCC Directory! I 'adopted', and was responsible for editing, the Hawai'i list this time around. 1. Chicago could be left without its own postmark if the Cardiss Collins P&DC downtown loses its originating mail to suburban plants. Ditto Fort Worth, whose P&DC would be responsible for destinating mail to Dallas while losing originating mail to the North Texas P&DC. 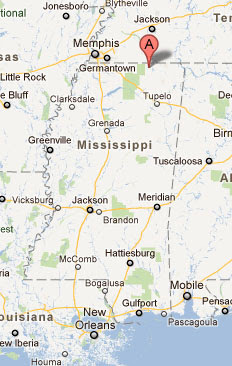 Not to mention New Orleans, which loses everything out to Baton Rouge. 2. 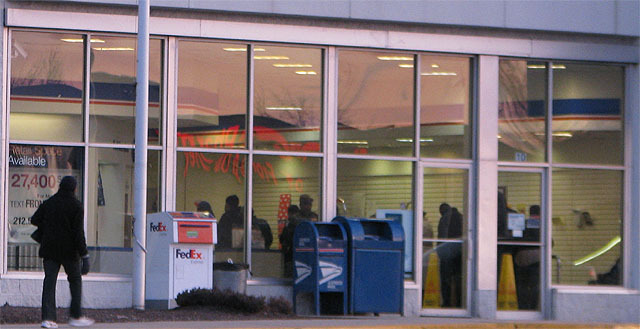 The amount of mail crossing state and postal District borders to be processed would now be astronomical: some Connecticut Valley mail would be processed in the Westchester District; there's Baltimore District mail headed to Central Pennsylvania; Nevada-Sierra processing occurring in Salt Lake; northeast Texas mail handled in Louisiana while the mail processing equivalent of musical chairs occurs among the Dallas and Fort Worth Districts. In fact, New York's Triboro District might be the first left without any originating mail processing facility if all its mail gets postmarked in New York's Morgan P&DC. 3. Given the dissolution of mail processing boundaries by state and District lines, what do the AMP consolidations mean for the postal hierarchy, and who's responsible for resolving consumer affairs and other issues as they pertain to mail handling? 4. Building on the above, would Virginia residents really be pleased with a postmark from North Carolina; Texas residents with a postmark from Shreveport; Tennessee residents with a postmark from Atlanta; Savannah residents with a cancel from either SC, GA, or FL? Et cetera. 5. What about security issues? What if, say, dangerous pieces of mail couldn't be sourced locally since mail processed at a given plant could have originated from any of 500 post offices across three states as opposed to a localized cluster? 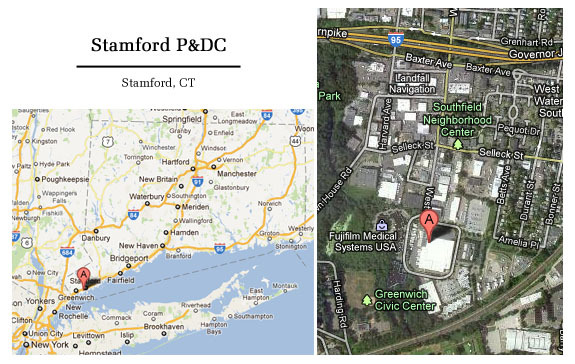 So, let's look at some photos of scheduled-to-close P&DC/Fs that are a part of their hosts' respective main post offices. Will these locations be moving to smaller, predominantly retail sites now, or be used as "delivery hubs"? 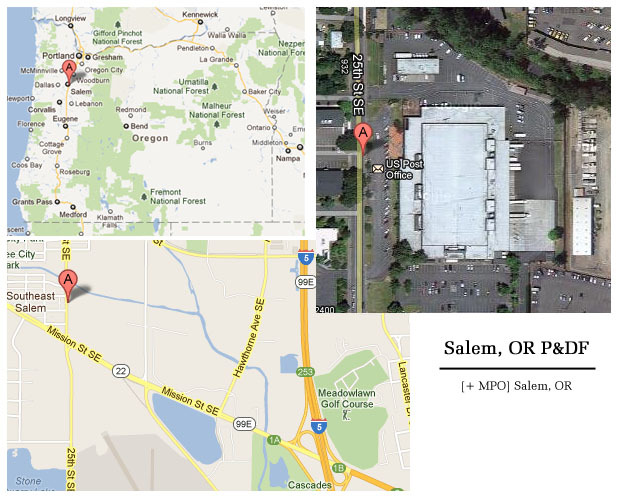 > Originating and destinating mail to be consolidated into the Portland, OR P&DC. When I was visiting the MPO I met the philatelic clerk, who was very friendly and offered to get the Postmaster's autograph on a couple of the cards I got hand-cancelled. She mailed them back to me later that week. As far as location, note the continuation of a trend that you might have noticed the emergence in my previous entry, of on the map below -- namely, the proximity of the processing plant to the local predominant highway. The present mail processing system wasn't created without thought. 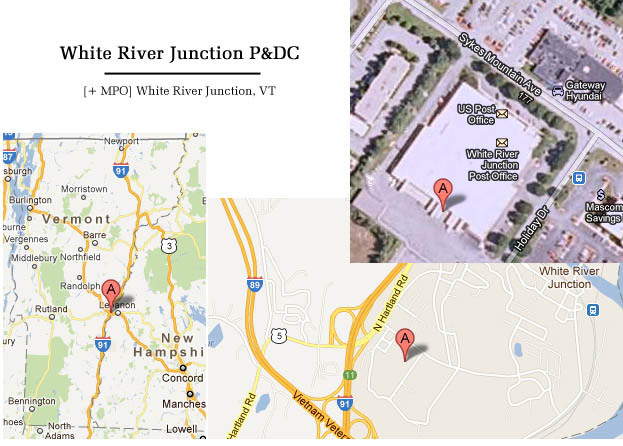 > Originating and destinating mail to be consolidated into the Manchester, NH and Burlington, VT P&DCs. Ah, White River Junction. This facility has easy access to two Interstates and has been around since 1984. The MPO also moved out here from a beautiful downtown WPA office that became known as Lyman Station. Officially closed last summer, Lyman Station had been a box unit with no retail services for some time. The current location, among a (Vermont-sized) sea of car dealers, exhibits decidedly less grandeur. On the plus side, the study to consolidate the decidedly large Manchester, NH P&DC (which shares residence with the Manchester MPO) was disapproved. 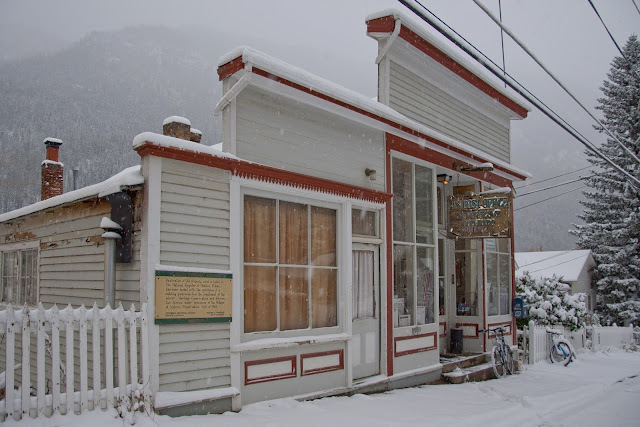 I'm always happy to publish photos from other postal fans showing post offices from around the country -- especially if they provide stories to go along with them. I thought it was about time to publish a few submissions here! Located in north central Colorado along the I-70 corridor, the town was so named as a former silver mining camp. The population of the historic town was 203 as of 2000. It's a popular tourist town during the summer, with some of the activities detailed on the Colorado tourism site. The next closest post office is about two miles away as the crow flies, though walking to it would be out of the question: you can only access the neighboring town, Georgetown, CO, by the Interstate. And if it's snowing, you would probably rather admire your town by walking. 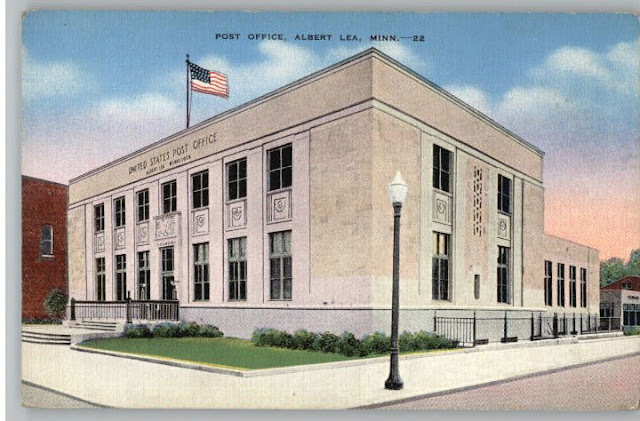 A local postal employee notes that while the Albert Lea post office is not in danger of closure, the town takes pride in its WPA post office. There are lots of beautiful details that employees and customers admire alike: "There are carvings on the front of the building depicting the history of the postal service, including images of pony express and early air mail. The inside has a lot of beautiful woodwork and terrazzo tiles in the lobby in intricate patterns. There is also a lot of decorative plaster designs on the ceiling around the light fixtures." "Many of the original glass globes for the light fixtures were cracked or broken. About a dozen years ago the maintenance man was looking to replace them but could not find anything like them. Then he happened to go into a kitchen store in a nearby town. Here he found many salad bowls that were the same size and shape as the original glass ones he was looking for. He bought enough for each fixture, drilled holes in the bottom of the bowls, and attached them to the fixtures. People cannot tell that they are not original. There is also a beautiful stained glass window in the lobby stairwell going up to the second floor. Today the building looks the same as when it was first built." "I lived in Pool for 3 years back in the early 90's. The Post Office there was in one corner of an old farm house. It was about 9' by 12' big. Two sisters and two brothers lived at the farm and raised sheep. The farm had belonged to their parents and none of the four had ever married or left. Colorful, friendly people. They invited me into their house once to show me their Charlie Brown Christmas tree. One of the sisters (the names escape me) was the postmaster and seemed to always be there no matter what time of day you stopped. You walked through the yard, where the sheep roamed, to get to the PO which had it's own entrance. When I first moved there I went in to get a box and the lady said "Which one do you want?" She had about 50 boxes but it seemed that no more than 20 were ever used at one time while I lived there. I picked PO Box #25 because it was easy to remember. Interesting enough, that was the first place I ever bought the self-adhesive stamps when they were brand new. I remember the lady telling me about them when I was buying stamps and offering the choice of the old ones or the new ones. When I moved to Pennsylvania (near Philadelphia) shortly after that I went to the West Chester, PA post office to buy stamps and when I asked for the self-adhesive kind they had no idea what I was talking about! They actually had them first in that little PO in Pool. Pretty cool!" And, if you can't get enough post offices images, another website that focuses on Illinois and Iowa facilities can be found at Post Office Freak! Save the Post Office ran an article yesterday regarding a document issued by USPS in response to a PRC inquiry that confirms what post offices were either discontinued or suspended last year. STPO has conducted an interpretation of the data, including the numbers involved. Here I just seek to establish what information you can take the bank and what just doesn't quite add up. While I think it's in everybody's interest to know exactly what's going on with postal closures by means of data transparency, I'm also particularly interested in this information as a volunteer who helps to maintain the state-by-state Post Office Directory for the Post Mark Collectors Club -- the most accurate listings of post offices, classified units and CPUs you can get these days. I'm currently helping to revise the New Jersey listing. The document in question is located here. Sheet 1, a list of offices that were discontinued last year, appears accurate. The former signage is still apparent if you look closely. Sheet 2 states what post offices were under suspension as of 1/1/12, and the results are interesting. While in many cases the information with which I'm familiar is is correct (including closure dates), I'll say take this one with a grain of salt. For example, Wilkinsburg Finance in Pittsburgh is definitely still open (as I visited it in November), so it can't have been suspended to the present day since 5/28/10. Similarly, Philadelphia's University City Station is the closest post office to my university's campus and I visit it frequently, so how it's been under suspension since 1/12/06 is beyond me. Incidentally, what's with all the botched values in the top few lines of the spreadsheet is beyond me. If someone were to have the time, I'm sure it's possible to somehow associate the office name with its appropriate state and ZIP code. 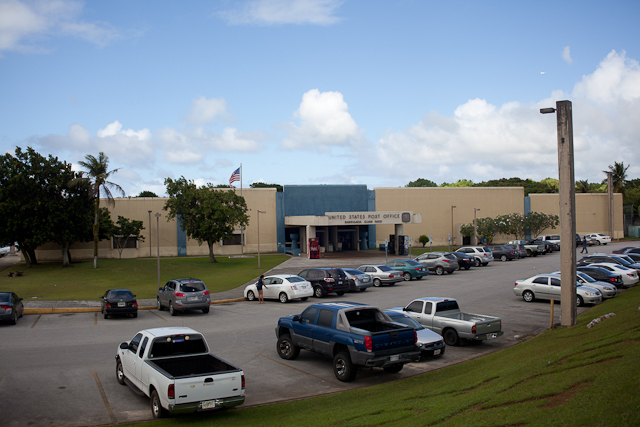 Sheet 3: a list of facilities supended since Jan. 1, 2011. The first thing you might notice is that the North Palm Springs, CA is to be suspended as of 3/2/12. I was shocked to see Milltown, NJ on the list, since it's a sizable town and not adjacent to any other offices. Lo and behold, a Facebook fan told me that the office has been operating as a boxes-only mobile unit since the building was closed due to flooding, so I suspect these listings are accurate. (Similarly, I discovered a note about the suspension of the Whippany, NJ post office on the official website for Hanover Township. They have been told it's temporary.) Shickshinny, PA, an an office suspended last year due to flooding, is listed; it reopened very recently. Some of these dates are inconsistent. For instance, in Sheet 2 we learned (line 124) that the Greystone Park post office of Morris Plains, NJ was suspended 3/27/07; yet on sheet 3 it's listed as having been suspended on 1/31/12. The Milltown, NJ post office has been suspended as of 8/28/11. This photo was taken in February. 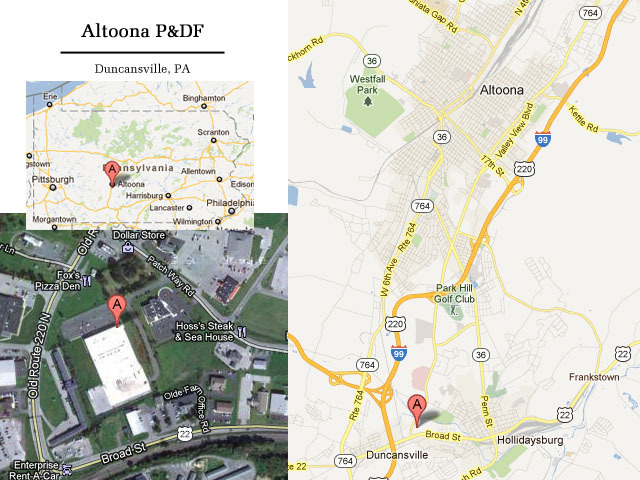 I've written about the suspensions of a couple of the offices listed: Elmhurst, PA; Johnsonburg, NJ; Mahanoy Plane, PA. I know all three listed dates to be accurate. Sheet 4: Offices removed from RAOI, appears accurate. It's an updated version of the response to my FOIA received a couple of months back, and all appears consistent. 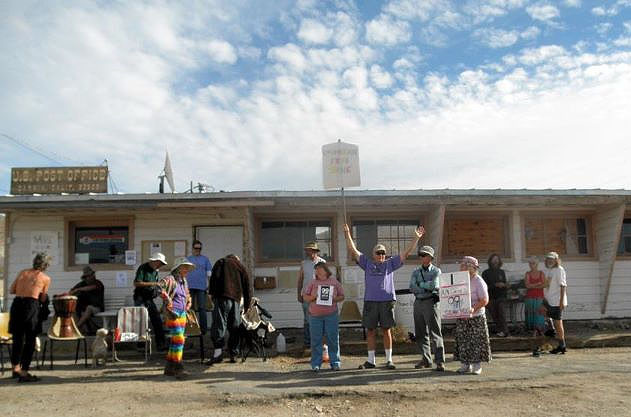 This was a friendly location that I visited back in 2009, and was not a ghost town by any means. What I will note is interesting is that some Districts appear to be far ahead of others in the analysis of their respective RAOI offices. You can judge the extent of that prospect for yourself. Sheet 5: Final Determinations issued since the start of 2011. This, too, need to be taken with a bit of a grain of salt. My friend Kelvin notes that the Final Determination issued for Gilbertville, MA was the determination that it would become a branch office at the beginning of this year. It's worth noting that while "only one" FD was issued in NJ last year, many other stations and branches were formally discontinued. As far as dates: they are accurate in some cases, but strike me as being way off in others. In many cases the dates are 3 to 4 months ahead of the actual discontinuance of the office.